For more than eighty years, APA – The Engineered Wood Association has focused on helping the industry create structural wood products of exceptional strength, versatility and reliability. Combining the research efforts of scientists at APA’s 42,000 square-foot research center with the knowledge gained from decades of field work, and cooperation with our member manufacturers, APA promotes new solutions and improved processes that benefit the entire industry. APA’s corporate headquarters are in Tacoma, Washington. A regional quality testing laboratory is located in Atlanta, Georgia. APA is a nonprofit trade association that has grown and evolved with the engineered wood industry. APA was founded in 1933 as the Douglas Fir Plywood Association, and was later recognized as the American Plywood Association. In 1994, APA changed its name to APA – The Engineered Wood Association to better reflect the range of products manufactured by APA members and the international scope of the Association. Read more about APA's history. APA members are comprised of well-known industry leaders, whose mills produce the majority of the structural wood panel products manufactured in North America, plus a host of engineered wood products that include glued laminated timber (glulam), cross-laminated timber (CLT), wood I-joists, and structural composite lumber. APA represents approximately 172 member mills in 23 states and seven provinces. APA income is based on member dues and other client fees. APA is governed by its members through a Board of Trustees and several member advisory committees that set policy, review strategy, and oversee implementation of strategic plans and programs. 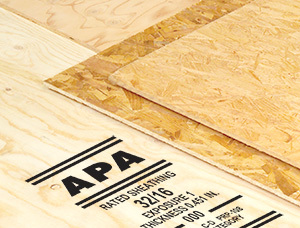 Always insist on engineered wood products bearing the mark of quality — the APA or APA EWS trademark. APA and APA EWS trademarks are the manufacturer’s assurance that the product conforms to manufacturing and product performance standards shown on the trademark. The mark appears only on products manufactured by APA members committed to APA's rigorous program of quality inspection and testing. Read more about the APA trademark. APA's vision is to maintain our position as the leader in creating engineered wood product growth for North American member companies. APA is a 501(c)(6) nonprofit trade association that represents US and Canadian manufacturers of structural engineered wood products, including plywood, oriented strand board (OSB), glued-laminated timber (glulam), wood I-joists and structural composite lumber. Its primary functions are product certification and testing, applied research, and market support and development. As a 501(c)(6) association, APA does not engage in lobbying activities. APA member manufacturers are comprised of well-known industry leaders, whose mills produce a majority of the structural wood panel products manufactured in North America. Plus a host of other products, including - glulam, wood I-joists, Rim Board and laminated veneer lumber.